Yes, "there she is," that honey-colored winged insect that emits a pheromone (perfume, if you will) that informs the rest of the hive all's well in their home. Children and adults never cease to be thrilled when they hear the story of what has happened in the hive to create a swarm of bees. Unfortunately, too many people fear this fascinating phenomenon in the life of the bee, but once understood, it ranks among the most wonderful happenings in nature. There is a male bee in the hive, but only briefly; his job is tiny when compared to all the other bees. He will take flight once to mate with the new queen, and after that, he is kicked out to starve. He cannot carry pollen, nor can he protect the hive; he has no stinger, so he is no longer necessary in the life of the honeybee colony. When people take the time to understand the role of the honeybee and the wild pollinators in providing us with the foods we need to eat and live, respect replaces fear. That's the goal of every bee class offered: to understand - and respect - the life of the honeybee. They don't have (or need) a wood stove or gas heater, the workers make the heat with their own bodies as they feed off the honey they stored all summer. It's a beautiful sight that first mild day in winter when the bees come out to do their winter cleaning. First off, you know they've made it through the cold. The workers are busy carrying out the bees that died, cleaning out feces, while some go to the nearest tree with wishful thinking to check for any chance of a blossom. When the first immigrant settlers arrived in the U.S. at Jamestown they had with them their beloved honeybees. We still see the descendants of those first bees pollinating our crops, still serving Man by going about conducting their everyday tasks. A world without honeybees would be a world without fruits, vegetables, nuts and seeds. Nearly one-third of the world's crops are dependent on honeybees for pollination, but over the last decade the mild-mannered honeybees have been dying at unprecedented rates in the United States and abroad. And right beside our domestic honeybee are the natural pollinators, such as bumblebees, wasps, beetles, flies and a host of other insects, bats and birds. To understand the role and health of pollinators is the best guarantee of having food in the future. Note: Jim Anderson is an instructor with the Tumalo Bee Academy. 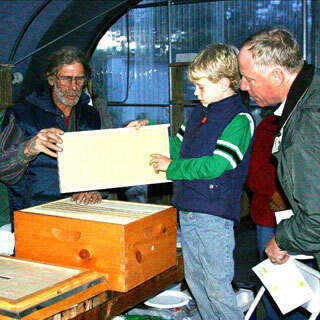 The academy provides credible knowledge and hands-on training to all walks of life in the art of beekeeping. Anderson and fellow instructor Steven Harris are long-time beekeepers in Central Oregon. Harris is an accredited OSU Master Beekeeper. The curriculum will be comprised of in-class lectures, hands-on training and in-field work on local hives and apiaries. There will be different levels of participation available. Each month, on the second Tuesday, classes will be held at Tumalo Garden Market at 6 p.m., with frequent field classes. The first meeting was meet-and-greet with handouts of schedules and class topics. Next meeting will be a honey-harvest demonstration that promises to be sweet as honey.